Are you experiencing more and more Canada geese conflicts every summer and want to learn how to get rid of geese? Does it seem that every year, there are more geese on your property? Canada geese love the large open expanses of fertilized, mowed grass found in our parks, golf courses, and backyards. Unfortunately, this may result in an abundance of droppings on our green spaces and walkways and may lead to other conflicts that include geese nesting in inappropriate areas, aggressive defense of nests by the geese parents, and issues associated with people feeding geese. The good news, though, is that it’s pretty easy to encourage geese to move elsewhere so that you can once again enjoy a summer with less goose poop and fewer conflicts! 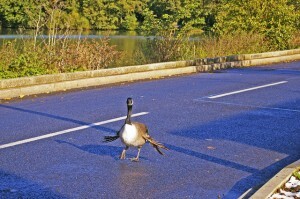 The goose is beautiful but those droppings… now they are an eyesore, and stick to your shoes. When you have a number of geese nesting in an urban area simply sticking a coyote effigy in the ground or an alligator head in the water to scare geese away won’t work (for long, anyway)! Geese are smarter than we give them credit for. The best way to encourage geese to move on from your property is to take a comprehensive 3-pronged approach: reduce their population size through egg addling, harass adult geese away, and alter the habitat to make it less appealing to geese. A word of caution, though, in order for these methods to be successful you have to get the timing right. First, it’s important to know that there are two types of Canada geese: resident Canada geese and migratory Canada geese. Migratory Canada geese head north for Canada in the spring to nest and don’t return until the fall. Resident Canada geese, however, stay around all year-long and are the geese that often come into conflict with humans. They build their nests in the spring (usually in late March), tend to their goslings who hatch in mid-May, and lose their flight feathers for about 6 weeks during the beginning of summer (this is called the molt). The best way to tackle conflicts with geese is to reduce the number of goslings that hatch every year in the spring and send adult geese on their way before their summer molt. Then, you can enjoy your goose-free summer and, if necessary, resume harassment after the molt ends (usually in August.) and into the fall season. The first step is to reduce the number of goslings that hatch through egg addling. To addle Canada goose eggs means to stop the development of the embryo, which is accomplished by covering the eggs in 100% corn oil, replacing them with “dummy eggs,” or removing the eggs and nest entirely. Addling is performed during Canada goose nesting season, which typically spans from late March or early April until mid-May. Addling is an inexpensive, easy way to reduce the number of geese and goslings in your area. This method has the added benefit of freeing up adult geese from their dependent goslings in the summer, which allows you to harass them away after the conclusion of nesting season. 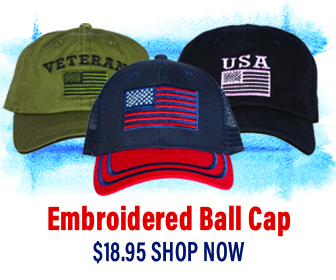 Get instructions on how to addle Canada goose eggs here. You’ll need to register with the U.S. Fish and Wildlife Service online if you want to pursue this option, and follow any additional requirements stipulated by your state wildlife agency. As mentioned above, successful egg addling not only prevents the hatching of goslings – it also frees up adult geese from dependent goslings and allows you to harass them away from areas where they’re causing conflicts. 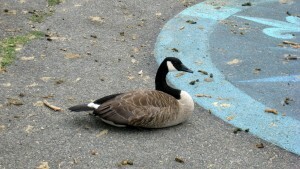 The best time to harass geese is after the nesting season and before the molt (usually mid-May through mid-June). Concentrating your harassment during this time makes geese feel unsafe in your parks, golf courses, etc. and encourages them to move elsewhere for their 6-week molting season. When their molt is over (usually in August), you can resume harassment as needed throughout the rest of the summer and fall. How do you humanely harass geese? One of the most effective methods is to use specially trained dogs (border collies are often used), who pursue, but do not harm the geese. Working with a human handler, the dogs herd the geese off the land and out of water bodies, making them feel unsafe and encouraging them to fly elsewhere. Lasers or strobe lights used on water bodies at night can be used to increase the pressure on geese to move elsewhere. Chemical repellents are also available that can either be sprayed on grass or dispersed as a fog, but they must be reapplied after every rain and mowing. Check with your local extension office or humane wildlife control service provider to find out more about these options. Combining harassment techniques and preventing the geese from become accustomed to any particular approach will increase the effectiveness of your efforts. Plant tall grasses and shrubs along the edges of a pond, add a fence, or plant emergent aquatic plants along the shore. Any of these steps make it harder for geese to take to the water for safety, greatly reducing the site’s appeal to them. Decide how much lawn area you really need and replant what you don’t need with tall grasses or shrubs, or let the grass you have naturalize. This blocks the sight lines that geese need to have in order to feel secure enough to nest in an area. At ponds where public feeding of geese has attracted an excessive number of geese, consider signs and public outreach to explain the problem and discourage feeding. 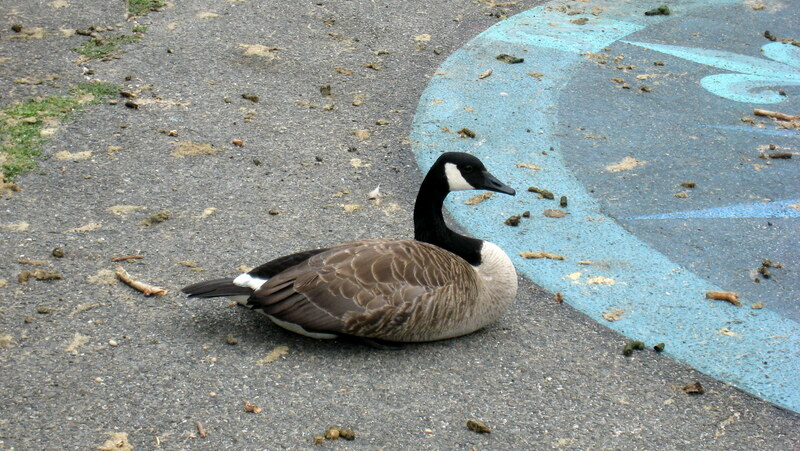 Once adult geese have chosen nesting sites close to building entrances, porches, or other areas heavily trafficked or used by humans, conflicts can arise when the parents defend their eggs and goslings. An inappropriate nesting site can also be one that will result in harm to the goslings when they hatch and can’t follow mom because of an obstruction or because they will fall from a significant height as she tries to lead them to water. Click here for more information on what to do to prevent geese from nesting or help them if they hatch and are in danger. Contact your local waterfowl rehabilitator or wildlife agency for more information or assistance. This Canada goose suffers from “angel wing” making him unable to fly and escape predators. All of your best efforts may be for naught if people in your community or on your property are feeding geese. Feeding geese not only causes them to congregate, but can also be harmful to their health (geese that eat bread, for example, can develop a condition called Angel Wing that leaves them unable to fly). If feeding is taking place in your area, post signs about the harmful effects of feeding and consider instituting feeding bans and/or fines. Robert/Nick: Many thanks for feedback. I might have an interest to know of almost any positive aspects to the SEARCH ENGINE MARKETING campaigns once this is integrated. Hey Buddy!, I found this information for you: "Learn How to Get Rid of Geese". Here is the website link: https://effectivewildlifesolutions.com/get-rid-of-geese/. Thank you.